You know how when you’ve done something a thousand times you think EVERYONE knows how to do it? Yup, that’s how I felt about wedding invitation assembly until I was chatting with a wedding planner friend of mine who mentioned it would be super helpful to know the proper way to assemble them. So VOILA! I made a video tutorial about it! With a few other tidbits about envelope liners and belly bands thrown in. I hope y’all find it helpful - let me know if there is anything I’ve missed! 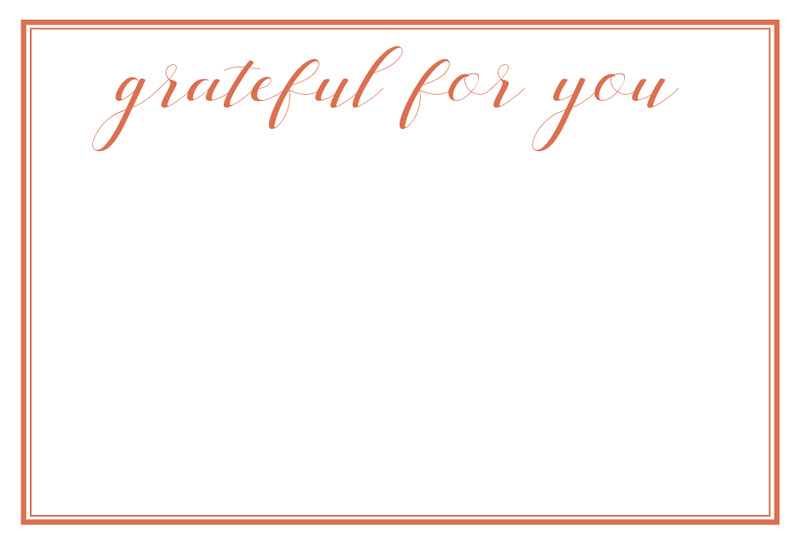 Last November, I decided I wanted to write simple notes to people in my life that I feel grateful for. Y’all. The response to these notes changed my perspective and was so uplifting for ME. I’m convinced we don’t take enough time to notice and appreciate those around us. So this “thankful season” take a minute and write a note to someone that has made a difference in your life. 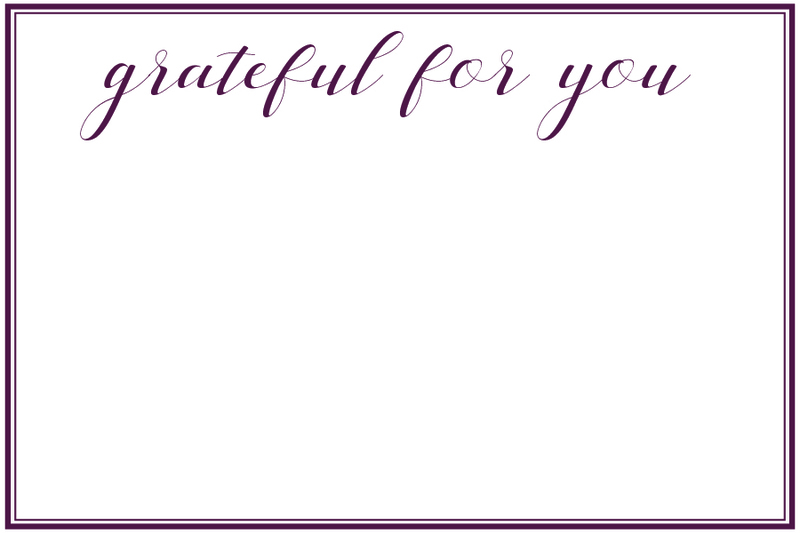 And I’ve made it super simple for the note to be pretty - just download my gratitude notecard below. Having a hard time narrowing down who to write to? Make a list! Here are some of the folks I wrote to: my mom friends, our pastor, my aunts, my kids’ teachers, my pediatrician, my old bosses and vendor friends. So, you got engaged - HOORAY! Now all.the.planning. One of the first things you will probably do is pick your date and venue. After that you’ll probably book your photographer and take engagement photos. THEN COMES THE REALLY FUN PART - wedding paper! Save the dates have become pretty common but there is a wide variety of choices and so I thought I would break them down for you a little! There are definitely advantages to both. Y’all aren’t surprised to hear that I lean towards the snail mail Save the Date ;) but I also know that in this day and age people are way more apt to send invitations electronically. There are several great web sites that you allow you to upload custom designs and track responses from guests. My personal favorites are Greenenvelope and Paperless Post. Of course you can also upload a .jpg in a regular email server and BCC all of your guests too. This is a popular option because then clients don’t have to pay extra for envelopes and the postage is slightly less as well. I love this choice because then guests can just stick them up on their fridge. I will say - these were much more popular about 5-7 years ago but I still get requests for them like the couple's save the date below. These can range from flat printing to foiled (like the example below) and vary in size although the most popular are typically 4x6 or 5x7. Definitely not! While it is very common right now to see couples engagement photos on their save the date, its not a must have. In fact, there are some gorgeous non-photo save the dates options like the one below. So, don’t feel pressured to take engagement photos JUST for the save the date! 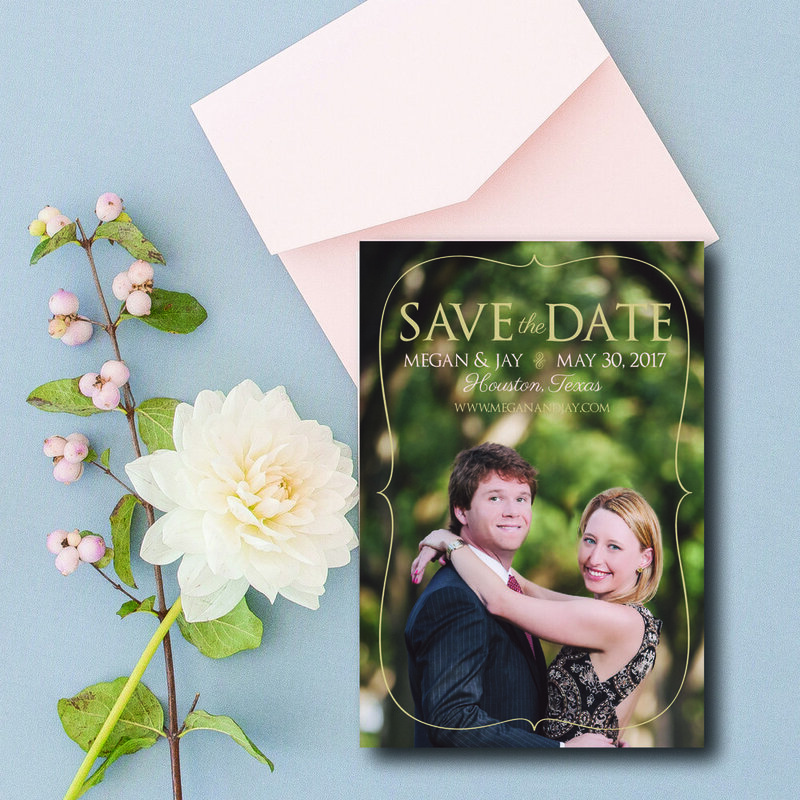 There are several schools of thought on this - but traditional etiquette dictates sending the save the date about 6 months prior to the wedding. It can go up to about 8 to 9 months if you are having a destination wedding or if you have a ton of out-of-town guests that will need to make travel arrangements or if your wedding falls on a holiday weekend. Hey Y’all - so I realized I have been designing custom holiday cards for five years and I get some of the same questions every year so I thought this post would be handy to reference for all my clients. Spot a question I missed? Leave it in the comments! Do I have to have my photo(s) to order? NO!! You do not have to have your family photos to place your order! In fact, when you order I ask when you will have your photo(s). As long as I have them before December 1, we’re good! My standard holiday cards are 5x7 and include a front and back design (as many photos as you want to include!). Other options available are a tri-fold, gate fold, fold over, and circle die cut (NEW this year and great to use as an ornament!) all in varying sizes. It’s pretty simple. You send me photos (and design inspiration, if you’d like) and choose fonts/colors from my charts (I can also color match and use a specific font upon request). We talk about your vision and then I get to work! Two rounds of proofs are included in the pricing. Typically from start of design (once I have your photos) to in the mail headed to your house is about 2 weeks. As we creep closer to Thanksgiving that can go up a few days. Best to order early! Yes! I offer both guest addressing ($1/envelope) and return addressing (.50/envelope) printing in coordinating fonts/colors to match your cards. If I were you, I’d click the button below and order yours today - I am only taking on a limited number of custom holiday card clients this year! 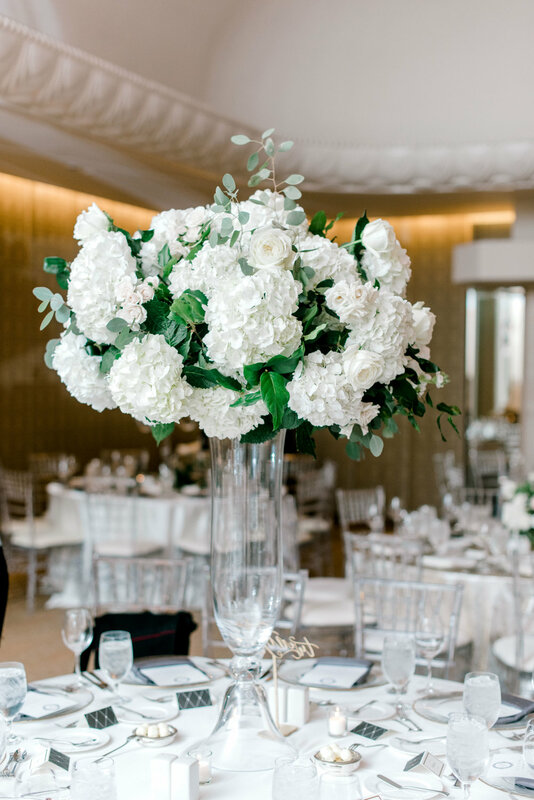 Kimberly and Ross had the most dreamy Houston wedding with their ceremony taking place at the beautiful St. John Vianney Catholic Church and reception at the Four Seasons Hotel Houston. I loved working with Mallory from Two be Wed to make Kim's vision come to life for all of her wedding paper! I designed a custom monogram that was foil stamped on the wedding invitation and wedding program. 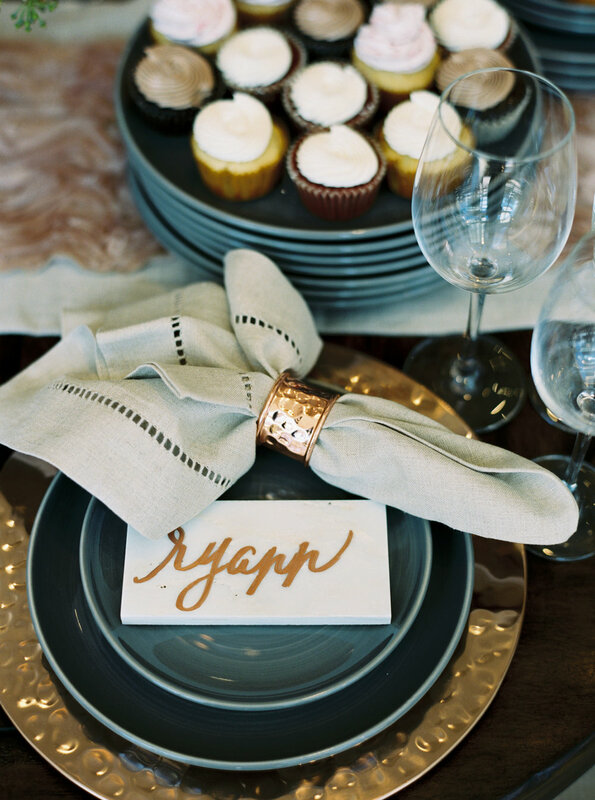 Some of my other favorite details are displayed below from the ever talented Dana Fernandez Photography. That welcome sign?! All the heart eyes y'all! Just as wedding invitations set the tone for your big day, so do the fonts you select for your wedding invitation suite! There are SO many fonts to choose from - how do you possibly narrow it down? By asking the following questions! 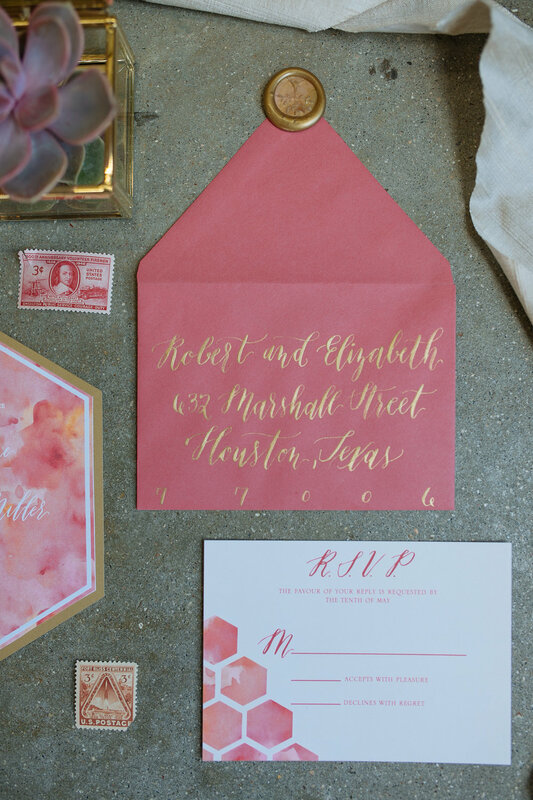 I hope this got you thinking about how fonts can really change up the feel of an invitation! See below for a sampling of some of my fave font pairings! Still here?! Awesome! Here are some blog posts that feature a few of these font pairings! When Brittany Williams, a good friend I've met through this amazing creative entrepreneur community asked if I'd design an invitation set for another creative friend of ours, Christina Frederick - I was overjoyed! You see, Christina is probably one of the sweetest, most genuine ladies I've met and she has had a tough journey to motherhood so this baby was a true blessing from God. You can read more about her pregnancy journey and announcement in her blog post here. The theme for Christina's shower was a "blueberry brunch" because Britt had heard that Christina LOVED blueberry pancakes during her pregnancy! Also, Christina didn't divulge the gender of the baby before the shower (spoiler - we were some of the first to find out it was a BOY at the shower!) so we kept the invitation pieces gender neutral with pinks, blues and florals. The soft watercolor and touches of gold were the perfect additions! Hostesses: Brittany Williams (Butter Artistry); Jessica Gentry (Feather Thread); mama-to-be Christina Frederick (Christina Leigh Events); Meggie Mangione (Organized Life Design) and Selby Bush. I don't know about you, but my grandmother had beautiful handwriting (it was cursive, y'all) and so does my mom. I have very neat handwriting but its not stop-and-stare pretty like theirs is. So I've recently been on a mission to find ways to preserve their handwriting and I came up with the following list! I'd love to hear any other ideas y'all might have - share in the comments! These tea towels would be so fun to use for old recipe cards that have been passed down from generation to generation! I love things that are both functional and meaningful! Well, y'all knew I couldn't include a blog post about preserving handwriting without including a unique way to preserve your wedding invitation! I love how personalized these plaques are! Now here is something I'd like as a gift at some point - a necklace featuring my kids handwriting. If anyone happens to know my husband - feel free to send the message along! In our family, Christmas ornaments are collected on every single trip we go on and its such a special keepsake and makes decorating our tree full of memories every year. So, of course I loved the idea of adding a handwritten ornament to our tree! This seems like a pretty easy DIY project to either use or display in your home. You can find the full tutorial over on the Reluctant Entertainer's blog! Now, I have saved the most important for last. These are what really spurred this post. Last November, I made a pledge to hand write a note every day to someone I was grateful for. Not only was it special for the recipient to receive but it allowed me a moment every day to reflect on how many people have touched my life. I also make my children write thank you notes because I want to instill in them a sense of gratitude. From the moment I met Amanda, I knew we were going to be a great match! She was warm, friendly and knew she wanted typography to be the main design detail for her custom wedding invitations. Amanda and Daniel are high school sweethearts and planned the most perfect Houston wedding with the ceremony taking place at St. Michael's Catholic Church and reception following at the beautiful Lakeside Country Club. Amanda was referred to me from my friend Meredith of Cake and Confetti, and I loved working on her full invitation suite and day-of paper goods. Isn't the marble envelope liner and soft velvet ribbon dreamy? Also, navy is one of my most favorite colors to work with. It paired so nicely with the pale blue as well. 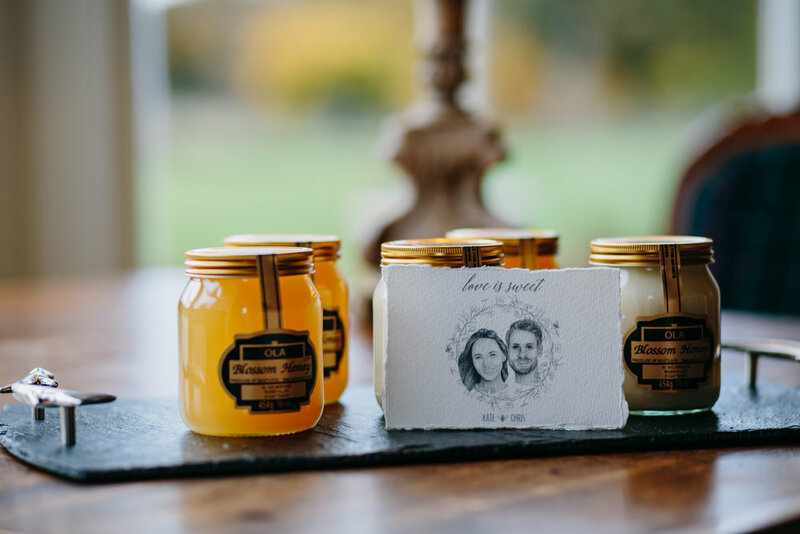 I'm so thankful that Amanda trusted me to brand her entire wedding - from the menu cards to the adorable matchboxes that had Amanda and Daniel's custom wedding monogram foil stamped on them! Interested in ordering this suite? See all the details here! I will be the first to say that planning a wedding is INCREDIBLY overwhelming. There are so many decisions to be made that it can feel never ending. I'm hoping this blog post will help you decide what the right path is when selecting wedding invitations. The very first question you need to ask is: what kind of experience is important to you in working with a stationer? Do you want the personalized experience of working with an independent designer or a less personalized experience with a big-box store? There are advantages of each option. If having a custom wedding invitation that is designed especially for you isn't a high priority, you might consider a big-box store or site. One of the main advantages of choosing a bigger company is that you’ll be able to see your invitation the exact way it will be printed and sometimes the cost is less to have foiling because the store uses the same die (the plate that is used for foiling and letterpress) over and over again and so they will not have to charge you for a custom die. However, there might be fewer options to customize your design, such as changing the colors and switching out fonts. 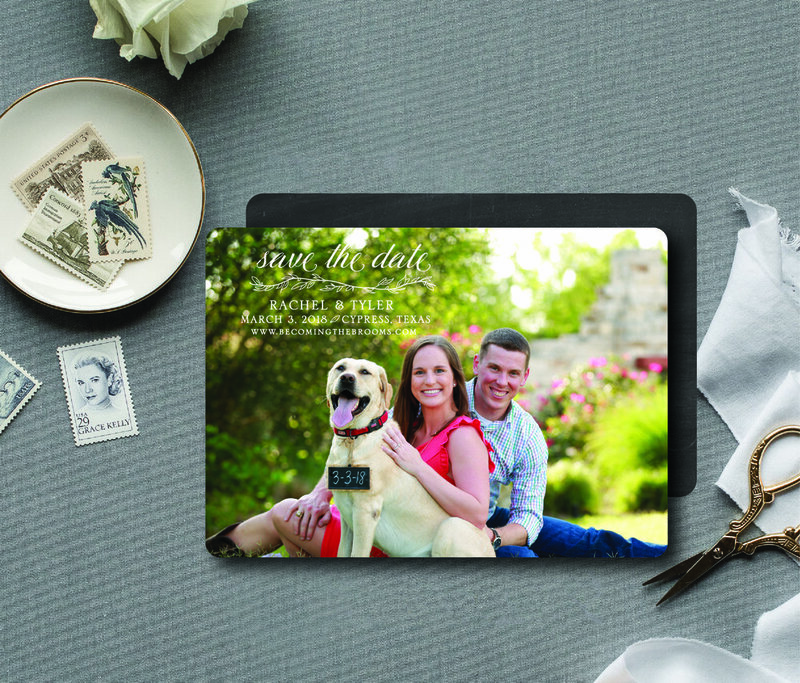 For example, with companies like Minted, you can pick from a ton of design options, and it’s cheaper, but you may have to format the invitation yourself. 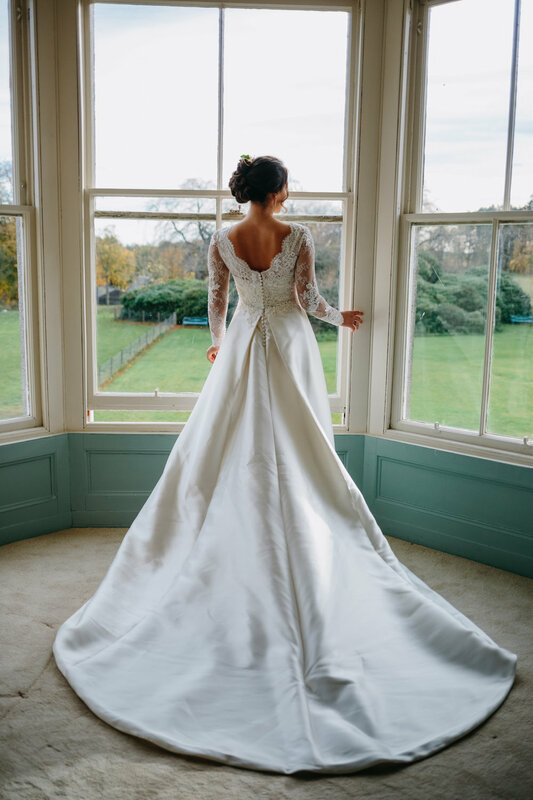 The other potential downside is the lack of one-on-one personal attention like providing a sample of your invitation to your photographer to be sure its photographed on your wedding day. With an independent stationer, you’re going to get much more of a personalized experience. You’ll have consistent contact with one person throughout the whole process to address any questions or concerns that arise. You can feel the paper and explore the different print options. The stationer will also work through what to order and when, design your wedding stationery, work with you on design edits and handle the printing of everything. This kind of individualized experience creates a personal connection with how your wedding suite is going to be made. Also, with a small company, you’ll have more options for customization, but—and here’s the potential downside—it may come with a slightly bigger price tag. That said, you might want an independent stationer even if you’re not creating a custom design just because you really want that personal experience in which you interact with a person and help a small business grow! Stick around and check out some of my recent custom work below! 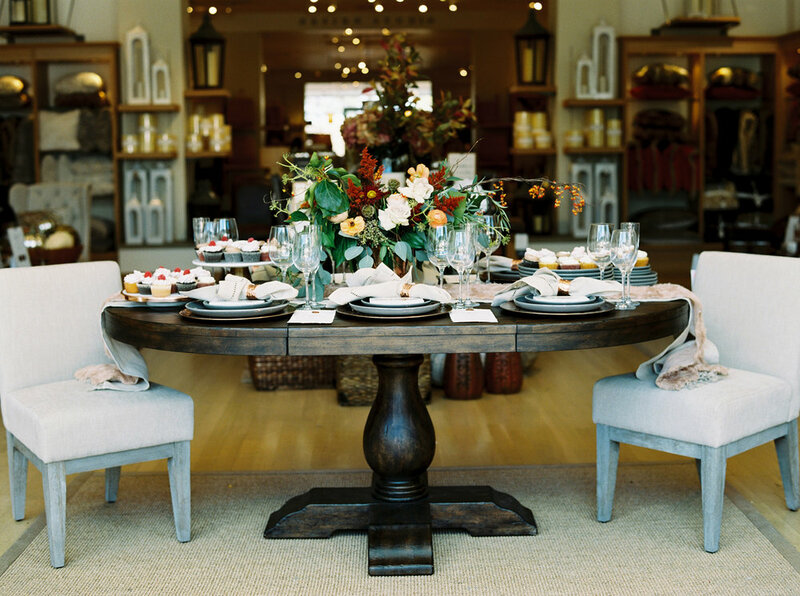 I don't know about y'all, but I could pretty much live in a Pottery Barn store. So it was like my dream come true when Christina at Christina Leigh Events asked if I wanted to be a part of a Thanksgiving styled shoot she was planning for Pottery Barn! When we designed this tablescape, we wanted to show that you can have an elegant Thanksgiving table without it feeling overly formal. Personalized place cards and menus for your guests make them feel extra special. Using organic floral arrangements and textured chargers and napkin rings add layers and depth to the setting which all come together for a warm and inviting table that your guests definitely won't want to leave! Maggie with Bramble and Bee really knocked it out of the park with the arrangements - I love all the fall colors! To accentuate the already gorgeous Thanksgiving place setting, I designed deckled edge (translation: torn edge) menus with cranberry wax seals. Keep scrolling for a quick tutorial on how to make your own deckled edge menus for Thanksgiving in just a few minutes! Here's how YOU can make deckled edge cards right at home in three easy steps! Use a bone folder (found here) - this is an optional tool but SUPER helpful and a ruler to make a crease along the edge of the paper (see video below - don't mind the crooked line I made!) Fold the paper back and forth over the crease about 4 or 5 times. CAREFULLY tear the paper on the crease starting at the top. It should leave you with a gorgeous deckled edge! For a fun touch, you can add a wax seal - I ordered mine from Get Marked and was really pleased with the quality. They also offer a wax spoon which makes things easier. This tutorial is very helpful in dealing with wax seals. A quick side note: if you want to re-use the seal or are worried about putting it directly on your project, you can stamp on wax paper, let the seal cool and then peel off and use double sided tape to adhere in the desired area! Some super talented creatives that took part in this shoot - from left, Jenny with A Fine Flourish, Courtney with Courtney Leigh Photography, Christina with Christina Leigh Events, me, and Butter makeup artist. PS aren't these marble place cards GORGEOUS?! You can usually source these at a local tile shop or on Etsy then have a local calligrapher (like Jenny!) letter on them! For us Texans, its sometimes hard to get in the Fall mindset as the temps are still in the 80's and 90's most days. I joke that I want to come up with a Southern fall clothing line that would consist of shorts, tank tops, sleeveless dresses, etc. all in fall colors - I think it would really sell! Even if the weather doesn't make me feel like it, designing these free Halloween printables sure put me in the Fall spirit. Not to mention my kids have been deciding and re-deciding what they want to dress up as for Halloween every.single.day! So, I decided a Halloween countdown would be a perfect printable so they know exactly how many days are left until that most prized holiday! Those pumpkins are new from Target. I made the wreath from this tutorial and added that cute ghost plaque from Hobby Lobby a few years ago (I die cut our last name with my silhouette and white vinyl). Download free Halloween countdown here! I also love banners of any shape and style so I thought it would be fun to design a little circle Halloween banner! To make it a tiny bit easier - I sized the circles to be exactly 2.5 in. and you can order a circle hole punch from Amazon here for $13 (or pick one up with a coupon at Jo-Anns!) that makes die cutting this cute banner a cinch! (its not an affiliate link - I just figured I'd save you the hassle of googling for it!) A side note when assembling - punch two holes in the top to string it, otherwise the little circles won't sit straight. Download free banner here! And let's be real, Halloween is a fun kids holiday but I also love to put a little "adult juice" in my cup as we go trick or treating! So I also created these fun drink stickers - "I'm just here for the Boos". You can also print on regular paper (this was orange card stock) and fun zig zag scissors to cut them out, then use double sided tape to adhere to your glass. Download free drink printable here! Happy Halloween from my family to y'alls! Download Halloween drink stickers here. I thought y'all might be interested in what goes on behind the scenes of one of the fine print methods used for wedding invitations that's so popular right now, foiling. I currently offer a wide range of foil options: gold, silver, champagne, white, rose gold and holographic. Incorporating foil really takes invitations to the next level as it sets the tone for a luxe, intentional event. Foil is a great option if you'd like to use a dark paper, like navy or black, because the foil is completely opaque and no actual ink is used. Foiling provides a metallic shine that letterpress and engraving really can't deliver. I used champagne foil to complement the gorgeous lettering on this wedding invitation. I used holographic foil on this fun 30th birthday invitation. Due to how labor intensive and custom this process is, foiling can get expensive. A custom die has to be made for every project I design - unlike the big box stores who can reuse a die over and over again because it doesn't have anything personal to the couple on it, like their names. Often, foiling is used in combination with flat printing which adds an extra step into the process. My go-to foil stamper, Neal McEwan with McGraphics, shared this about the process of foil stamping. The basic concept behind foil stamping is simple. The process is achieved when a die is mounted on a plate and heated. Foil is then placed between the die and the material to be imprinted. When the die presses against the foil, the heat releases the coloring layer from the foil roll and binds it to the end product. This video was created by Invitations by Ajalon. I'd love to visit with you about foiling your next big invitation! Creating custom wedding invitations for a couple gives me the opportunity to bring their ideas to life. Also, invitations set the tone for guests and allow them a glimpse of what to expect on the big day. Nothing gives me greater joy than a bride who is excited about all things wedding paper! From the instant that Meredith with Cake and Confetti introduced us, I knew that Katelyn would be my ideal client. She had a definite vision and I knew we would want to give guests a preview of it with the wedding invitation suite. Both Katelyn and her husband Sean have strong Scottish heritage which they reflected in almost every detail of their wedding: tartan ties and ribbon, thistle in the bouquets, and Scottish traditions during the ceremony. We tied this into the invitations by creating a custom hand drawn crest on the invitation and incorporating a thistle on the response card. It was truly a classic design while still nodding to the wedding's theme. Katelyn chose beautiful luxe double thick paper and envelopes, gold foil printing and beautiful typography. She knew the invitation would set the tone for her whole wedding and she chose each element perfectly to reflect their vision. I loved creating this invitation for Katelyn and Sean, but loved seeing how it tied into their actual day even more. I feel like we nailed it after looking through all the photos of their lovely wedding at The Astorian in the Houston Heights! One of my favorite things about being a wedding invitation designer is how creative I get to be in all facets of the design. From choosing the right color palette, to the right font, to the right number of pieces for your suite, to the print method used. We get to create something that is inexplicably “you" and that is one of the major differences between working with a designer versus ordering from a big box store. Something that my clients don’t always realize is that the actual words on the invitation can and should be customized as well. 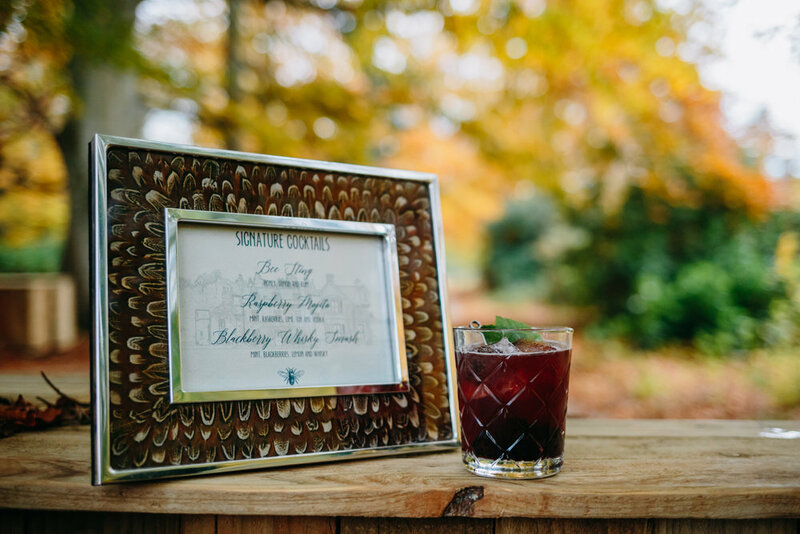 There are so many options available, and the wording can really set the tone for your wedding day so guests have an idea of what to expect when they arrive. There are some basics that you will want to include no matter what: the location of the ceremony, the date and time of ceremony, and where the reception will be. But there are so many different ways to introduce these details. Who is hosting? One set of parents or both? Or maybe it’s you, the couple. Do you want to use your full names, including your middle names or just keep it simple? Is the location difficult to get to? Do you want to use an enclosure card to share a map and directions? Do you have a wedding web site? A good place to include this is also on the enclosure card. Are there any special details or instructions guests should know about your venue or the wedding itself? For example, is it an adults only event? We can totally work that in too! 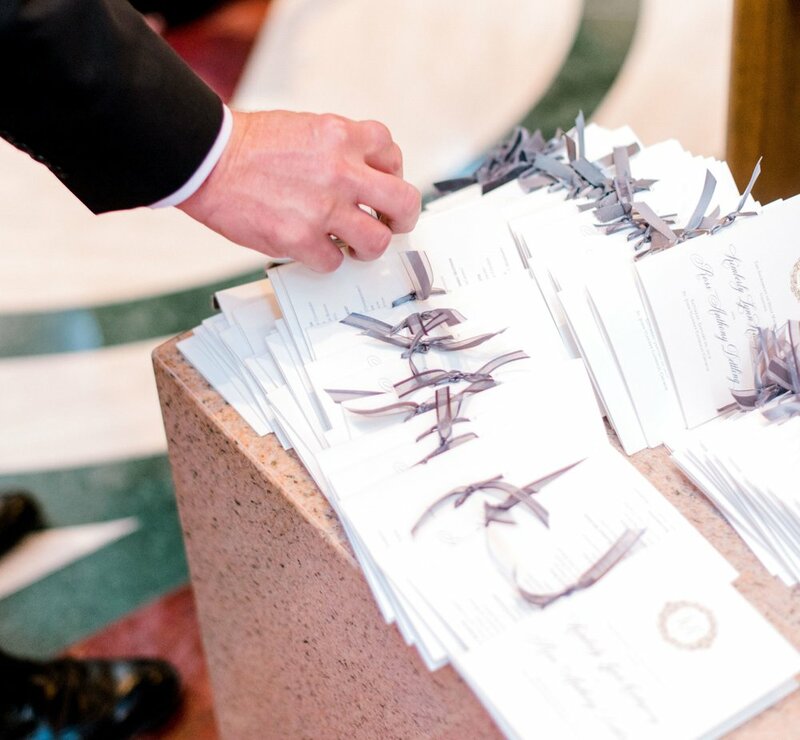 Traditional invitations typically stick closely to the rules of etiquette. In this situation, the bride's parents may host and we would use language like "Mr. and Mrs. Edward Hunt request your presence at the marriage of ..." This type of invitation typically has the date and time spelled out rather than using numerals and the language is a bit more formal. These are perfect for your wedding if you're hoping for something elegant and classic. I've also created invitations for more laid-back affairs, where the bride and groom just invited their guests however felt right to them. Maybe, "Together with their families" or "Please join Krista and Sam as they begin a joyous new chapter in their lives". Sometimes this is an easier way to write an invitation because it can be straight from your voice as a couple. We can make something as formal as a dinner at the White House or as casual as a picnic in your backyard. There is no right or wrong way to do word your wedding invitation and I'm here to help along the way! Its only two weeks away y'all! My husband and I don't really do anything big for Valentine's Day but we do have a journal that we write in to each other on special occasions and I love flipping back through it to relive some of our treasured moments together! Obviously, I also love creating fun, unique Valentines for my kids to take to their classmates. I try and design around something that is not candy because let's face it - they get SO.MUCH.CANDY on Valentines Day! You can check out this blog post to see some of the fun ideas I've created for my kids AND Annie's birthday party from last year. Her 4th birthday party is coming up this Saturday and I can't wait to share all that is Peppa Pig with y'all! But without further adieu - here is this year's FREE Valentine's printable! Interested in previous Valentines that I've designed for my kids? Check out this post! I know this is a tad late but I figured better late than never, right?! I hope your holiday season was wonderful! I wanted to take a second and share some of the custom holiday cards I created for my sweet clients this year! I still can't believe the holidays are all over - can y'all? I'm pretty sure we had 2 cold days total in Houston - the rest of the time we were in shorts and t-shirts! I know that it is probably so easy to go on Tiny Prints, Minted or Shutterfly and order holiday cards - but I'm so thankful for my clients that want a little more personal experience when ordering.. Not only are they supporting this dream of mine, but they also get to tweak every detail of their card. I don't know about y'all, but I keep every.single Christmas card we receive every year! If anyone has a good suggestion on how to organize these - I'm all ears! So without further ado - below is a snapshot of some of my favorite custom Christmas cards that I designed this year! I've worked on a few projects for this sweet family and was so thrilled when Kate asked me to design their Christmas card. The photos were taken by a long time friend of both of ours, Meredith Flaherty Photography. Lyndsay and I were sorority sisters at Texas Tech - isn't her daughter Parker Ann the sweetest?! And those beach photos - they definitely made designing so easy! Norhill Realty is one of my favorite clients because I always get to design fun, cocktail themed holiday party invitations! This year's watercolor Christmas martini might be my favorite! These sweet kids are like my second set of children. Its always such an honor to design for dear friends! Jen, the momma of those adorable boys, knew exactly what she wanted the design of her holiday card to look like - clean and festive. We were both so pleased with the final result! I loved getting to design this holiday card + adoption announcement for darling Joyce and her sweet dads! Ashley always has the best ideas for her holiday cards and this year was no different! I love the unique color palette we chose and the fun wording! I've known this sweet family since before they were even a couple! I loved getting to design not only their Christmas card but also precious Ellie's birth announcement that was on the back! Staci had a BUNCH of photos she wanted to share of her sweet boys so I made sure to create a format that allowed for four photos on the front and five on the back! When Samantha of Plan our Day asked me to be a part of a styled shoot with a color palette focused around sunset colors I was ecstatic! Then she mentioned that the photographer would be a friend, the ever talented Becki of Smith House Photography, I knew that this was going to be an amazing shoot. I knew I wanted to do a die cut for the wedding invitation and incorporate the hexagon shape on the response card as well. This was the first shoot that I got to work with my new favorite calligraphy and friend, Catrina of Camel and Birdie. She is the most giving, gracious soul and I thank God our paths have crossed on this crazy journey. Catrina lettered the bride and grooms names and then I incorporated them in the design. She also hand addressed the main and response envelopes. By now, y'all know I love a beautiful envelope liner and this gold shimmery hexagon paper did not disappoint! Vintage stamps and gold wax seals are a close second as well. Isn't this bouquet stunning? 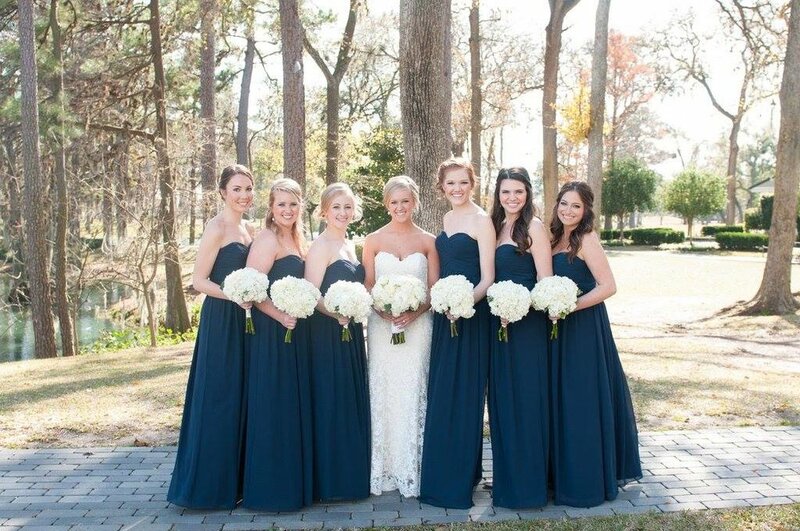 Amanda with Amanda Bee Floral had such a gorgeous vision for all of the florals. It's such an honor to get to be a part of my client's wedding day - but its even more special when I have a personal connection to the bride or groom. That was the case for Melissa and Corey - I have known Melissa since 2007 as her older sister, Amber, was my college roommate. (RMFL!) I was thrilled when Melissa contacted me to work on her wedding invitations. When we started to talk about design, Melissa asked if we could incorporate a hot air balloon because her super romantic fiancee had proposed on a hot air balloon ride! The watercolor background on the details card may be my favorite design element - I love how it makes it feel beach-y. Isn't this ceremony setting just dreamy?! The couple wed at Edgewater Beach and Golf Resort. I love all the thought that Melissa put into the beautiful details of her big day - don't you?? Invitation photos taken by Stacy Anderson Photography. Wedding day photos take by Arann Weatherman Photography.